With the first four races of the 2010 IZOD IndyCar Series completed, drivers, teams, and race fans are beginning to realize the major players to North America's open wheel racing tour. At the front of the field we have already seen the three-car team of Roger Penske winning three events. Recognizing Penske Racing as part of a 25 car make up of this season's grid, there is 25 different stories playing out through the 2010 season. Placing a quarter of the season in the books (there is actually 17 races on the 2010 IZOD IndyCar Series schedule but this is close enough to quarter distance) XSL Speed Reporter has compiled an evaluation to help establish the drivers' current performance after four races in the 2010 IZOD IndyCar circuit. While the finishing results have played an integral part in establishing gradings, considerations were made to acknowledge the individual drivers and teams whom have just entered the series for 2010 more favourably. Conversely, this quarterly evaluation has also shown the under-peroformance of some veteran drivers so far this season. Without a doubt, the Australian driver Will Power has found his transition back to a full season for IZOD IndyCar Series to be a dream. Finishing on the podium for all four events so far including two victories, Power's performance on road and street courses has been stunning. 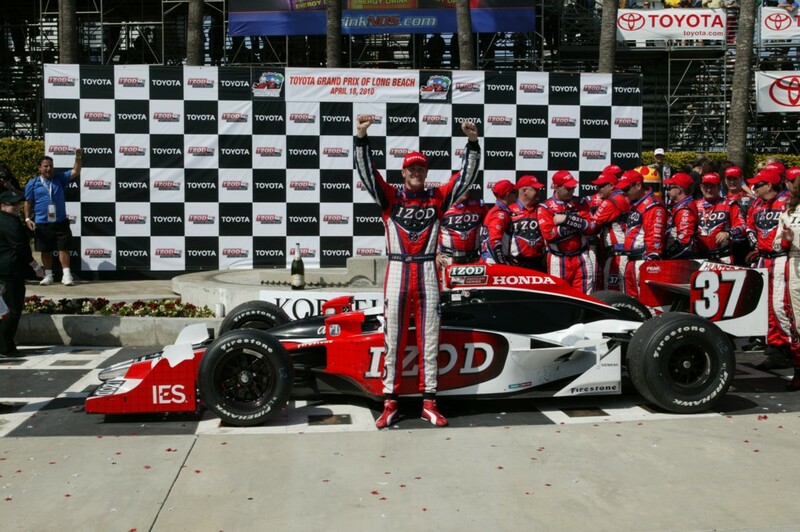 It will be worth seeing if Power's luck will hold as the IZOD IndyCar Series takes on the first ovals of 2010. Will Power has yet to score a major open wheel race on an oval. Showing great potential as a devoted American open wheel driver, the off-season announcement naming Ryan Hunter-Reay to the fourth car for Andretti Autosport was welcomed sentimentally as the driver shuffled through three IndyCar teams in the previous two race seasons. Starting off the year with a strong 2nd place in the opening race at Sao Paulo. A feel good story moment resulted as Ryan Hunter-Reay brought his #37 Andretti Autosport machine to the winner's circle at Long Beach. In a recent conference, Ryan Hunter-Reay shed light on the situation saying "When everything kind of goes right like that, to get a win out of it, to be the fastest car on the track, it was a very cool weekend. Long Beach was great. But there's no sense of fulfillment on the team. Come Tuesday we were done with it. We need to go on and win some more races, that's for sure." Moving from Dale Coyne Racing to the Dreyer & Reinbold Racing organization, the team has dedicated itself to improving their game with the entrance of last year's Waltkins Glen race winner. Finishing in runner-up positions at both St Petersburg and Long Beach, Wilson and the #22 Z-Line Designs car has been knocking on the door for victory in 2010. 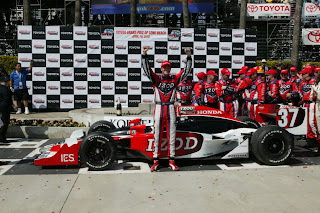 In describing the young season, Justin Wilson responded favourably on the 2010 start with Dreyer & Reinbold Racing. "It's been a great start to the season and exactly what I was hoping for. The Z-Line Designs 22 car has been pretty quick." 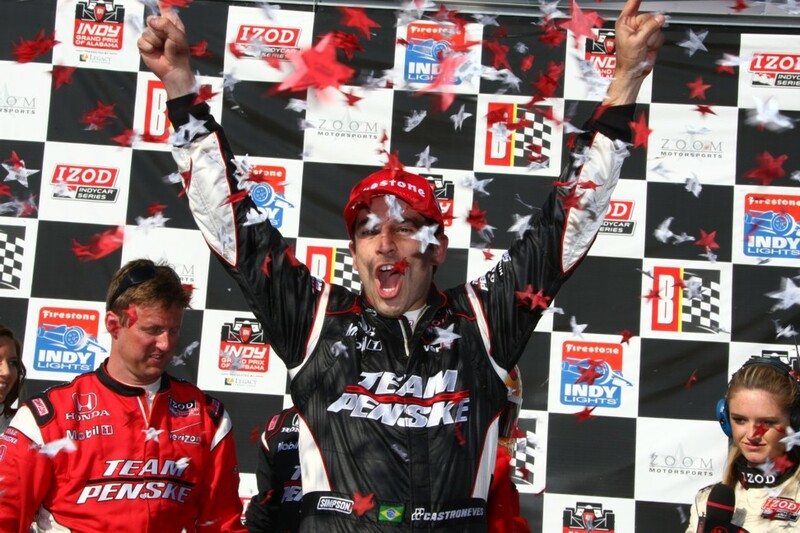 Breaking the two-race winning streak set by his teammate, Castroneves delivered his #3 Penske Racing car into victory at Barber Motorsports Park with the Brazilian's typical enthusiasm. Along with Will Power as drivers finishing in the top-10 for the first 4 events, Helio Castroneves is seated 42 points behind Power in the driver's point standings. Eluded from the IndyCar championship with three runner-up points finishes to show for his hard work, expect Castroneves to take any opportunity to close the points gap. Helio Castroneves will also be vying for a record-tying fourth Indy 500 victory in a little more than one month's time. With a season best second-place earned at Barber Motorsports Park, Scott Dixon and the Target/Chip Ganassi team has remained muted by their Penske Racing rivals from last year. The two-time IndyCar champion posted three finishes in the top-six broken only at St Petersburg. Fifth in the driver championship standings, do not count the New Zealand driver out contention to take it all in 2010. In 2009, Dixon recorded a 16th and 18th finish in the first two events to come only 11 points short of the championship to teammate Dario Franchitti. Four of Dixon's five wins for Target/Chip Ganassi Racing came on ovals. Starting on the front row for the Sao Paulo season opener, the newly-formed FAZZT Race Team built around Canadian Alex Tagliani made an early announcement that the race organization's #77 car was not going to be a field-filler. While the Sao Paulo IndyCar debut didn't end as strong as it began for Alex Tagliani, St Petersburg and Barber Motorsports Park races ended with top-10 finishes respectable for a new team. Tagliani and the FAZZT Race Team should remain an interesting story for the 2010 IZOD IndyCar Series. The sophomore year for Conway has been a productive outing in the #24 Dreyer & Reinbold Racing car. Placing in the top 10 for all races but St Petersburg, the British driver's qualifying speed at Barber Motorsports Park nested him a front row starting position alongside Will Power. Joined by fellow Brit Justin Wilson on the team for 2010, Conway's new teammate has been very satisfied with grouping. "..Mike's a good guy. It's a good, fun, relaxed atmosphere. There's no edge on the team. There's no ego, so we're able to concentrate on making cars go quicker." Spending five seasons in the team now wholly-owned by his father Michael, Marco Andretti has been facing greeter pressure to perform than even his teammates. 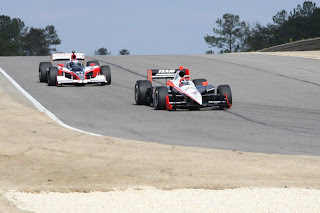 Leading two of the four races starting the 2010 season, a near win resulted at Barber Motorsports Park when Andretti led the most laps before forced to pit late for fuel. Finishing 5th in the Indy Grand Prix of Alabama, Andretti is in high spirits throughout the 2010 IZOD IndyCar schedule. "There’s so much for to focus on it really keeps you on your toes. But the ovals have a speed and intensity all their own so I do think it’s important for the series to stay balanced." Marco Andretti commented the XSL Speed Reporter interview. Rejoining the IZOD IndyCar Series in 2010 after suffering injuries in last year's Indy 500, Vitor Meira's return was marked with a strong finish for the once powerful AJ Foyt Enterprise's racing team. Meira's season highlight (and likely career highlight) was a 3rd place finish in the season-opening IndyCar race in his home country. Apart from that race, the rest of the 2010 IZOD IndyCar season has seen the #14 of Vitor Meira hovering around mid-pack. Out for much of the 2009 campaign, Meira missed most of the oval tracks last season but has a long-standing history which should elevate the AJ Foyt Enterprise's car. Returning to his Panther Racing #4 car, Wheldon 2010 season has started admirably with a 5th in San Paulo and a 9th at Long Beach. While the Brit has soon to be a force on both road courses and ovals, his first year with Panther Racing last season saw the Panther Racing car preferring the oval tracks in 2009. Dan Wheldon is continuing to pose a top-5 threat on almost any course on the IZOD IndyCar circuit. Named to drive a 3rd KV Racing Technology car within only a week to the 2010 IZOD IndyCar Series starting, Mario Moraes came into this year proving himself a worthy driver in the latter stages of 2009. Regretfully, a first lap accident at Sao Paulo and a poor finish at St Petersburg kinked the driver's momentum. Moraes' potential did reemerge at the Grand Prix of Long Beach moving up 9th spots to take 6th place in the event. Excelling on the ovals last season, Mario Moraes might be an outside shot for a first career victory in 2010. One of many new drivers who were given their seats within a month before the season started, Simona de Silvestro is starting to challenge Danica Patrick as the leading lady of IndyCar racing (at least on track so far). Among the rookie drivers, de Silvestro is demonstrating herself to be very pivotal candidate for the 2010 IndyCar Rookie of the Year award. However, with the ovals coming up, de Silvestro is facing a massive career milestone as starts the Kansas race. With road courses making up the final seasons of the Cooper Tire Atlantic Series, the 21 year old Swiss driver's approaches her first circle track experience with the same attitude with the road races, simply wanting to finish the event. Exhibiting speed which practice for at least one session at every event this season, Tony Kanaan and the #11 Andretti Autosports team has yet be able to impress in 2010 races. With the 2010 IZOD IndyCar Series starting on four straight road-type courses, Kanaan's lackluster results so far can be reasoned with through reviewing the Brazilian's career stats. His aptitude like many long-time IRL drivers is presented on oval tracks over road courses. In fact, Tony Kanaan's last win came at Richmond International Raceway in 2008. Though the year started with a career best 4th place run at Sao Paulo, the 2009 IndyCar Rookie of the year's race finishes in the de Ferran Luczo-Dragon Racing have been getting steadily worse. Despite the recent difficulties, Raphael Matos has caught alive a 13-race streak of running at the end of IndyCar races. Matos sits 9th in the points standings and will be eager to return to top-10 contention heading deeper into the 2010 IZOD IndyCar Series schedule. For a reigning two-time IndyCar champion, Dario Franchitti title defense is proving tough. Franchitti's season highlight so far includes a pole on the streets of Sao Paulo and a 3rd place at the Indy Grand Prix of Alabama. In an article inside the latest issue of PRN Magazine, Franchitti expected the season to feature strong efforts from old and new faces in the IZOD IndyCar series. Including Dario Franchitti, the Target/Chip Ganassi Racing is looking at the return to ovals as being a 2010 turning point mounting a challenge to Penske. Having spent two seasons with Andretti Autosport, Hideki Mutoh moved to Newman/Haas/Lanigan Racing sharing a mutual goal to find a place in the IZOD IndyCar Series. Since joining the series in 2008, Newman/Haas/Lanigan Racing went from the prime operation in Champ Car to being another mid-mark team in IndyCar. Finishing 20th in the first event, Mutoh has improved steadily with a 13th place at Long Beach. As the Japanese driver treks to the ovals with N/H/L Racing, expect Mutoh's experience in circle track racing improve the team's previously lackluster game off road courses. Migrating from the Firestone Indy Lights Series with a respectable 2009 effort which included two victories, the Brazilian Romancini was promoted to the big show in 2010 by Conquest Racing. Failing to finish two races, Mario Romancini best finish in the rookie campaign is a 13th at St Petersburg. Just one point ahead of Simona de Silvestro as the highest-placed newcomer in the IZOD IndyCar Series for 2010, Romancini's season in Indy Lights offers him a conceivable advantage having some experience on oval tracks. Posting her only top-10 finish with a 7th on the streets of St Petersburg race, Patrick's 2010 IndyCar campaign has been less noisy than her stock car debut earlier this season. Before citing Danica Patrick's diversification in motorsports as contributing to the slow start for the #7 Andretti Autosport team, Patrick's performance on road courses have remained a weakness since the tracks were introduced to IndyCar. Returning to the ovals, Patrick has the right to be optimistic heading into the month of May. Following a rookie season in 2008 which saw Viso hitting everything but the pace car, the Venezuelan driver earned a major career milestone in 2010 by finishing all of the first four events. EJ Viso has shown himself to be an incredibly fast driver, he's raked up 2 top-10 qualifying runs so far this season, but him and his KV Racing Technology team have to find more race pace into the rest of the year. Since the costly championship-losing miscue on the Twin-Ring Motegi race late last season, the Penske Racing driver continues to appear haunted by the incident into the new season. Having a chance to win the Sao Paulo Indy 300, Ryan Briscoe #6 car was leading in the late laps before mistiming his braking through turn five. Unable to break through for a top result until a 5th place at Long Beach, Ryan Briscoe can build his 2010 season if he can reestablish his podium-finishing capabilities. Playing in the big league of open wheel auto racing since 2002, Sato left Formula 1 for IndyCar officially in February. Despite his experience in the fast-running, hard-braking Formula 1 cars, Takuma Sato his found the KV Racing Technology car to be an entirely different challenge. Retiring from the first two events, Sato bad luck continued at the Barber Motorsport Park race where a throttle cable broke costing him 22 laps to the leader which was was unable to recover. The last round at Long Beach would result in an uneventful 18th place finish for Takuma Sato offering him a building block after four races in 2010. Dale Coyne Racing added two drivers late in the off-season signing Milka Duno and Alex Lloyd. Driving the #19 Boy Scouts of America car, the British driver has found it difficult to earn merit badges in the first races of his inaugural IndyCar season. Alex Lloyd's most dramatic appearance in 2010 has come at the Toyota Grand Prix of Long Beach for devious reasons. With Lloyd being lapped by leaders Ryan Hunter-Reay and Justin Wilson, the #19 car collided with #22 Dallara causing Wilson to pit for replacement front wing. The second-generation driver was batted all over the place in the off-season prior to the Streets of Sao Paulo premiere for the 2010 IndyCar Series. Unfortunately, when the green fell on the first race of the season, the Rahal name was nowhere in the running order. Thanks to a deal with Sarah Fisher Racing to drive the #67 car, Graham Rahal returned for the St Peterburg round. Placing 9th in his debut with the team, the limited road racing experience for Sarah Fisher Racing contributed to tough outings for Rahal at Barber Motorsports Park and Long Beach. Grateful for his opportunity with Sarah Fisher Racing, Graham Rahal is once again searching for a ride. Expect his name to return for Indy 500 qualifying potentially with Sarah Fisher Racing or another team. Having not started the start two races with Conquest Racing, the Belgium driver Baguette immediately faced an uphill battle. Having only 20th and 25th place results for 2010, it is unsure where Bertrand Baguette and the Conquest Racing team will sit in deeper into the season. Starting into her first full season campaign, Milka Duno is venturing to some race courses for the first time in her open wheel career. However, Duno's early showing in the Dale Coyne Racing team through the first four races have been dismal. At Barber Motorsport Park, she spent much of the race as a moving chicane contributing to some IndyCar fans questioning the Venezuelan's driving talent. Duno will return to the more familiar ovals seeking some confidence-building runs for 2010.